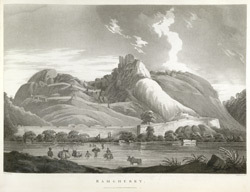 This uncoloured aquatint is taken from plate 14 of Captain Alexander Allan's 'Views in the Mysore Country'. Ramagiri is a hill near the town of Ramanagaram on the Bangalore-Mysore highway in Karnataka state. Being situated on the road between Bangalore and Srirangapatna, the fortress on top of this hill was of great strategic importance during the third Anglo-Mysore war. Allan wrote: "The fall of Sawandurg on the 21st, appearing to Lord Cornwallis an event likely to influence the conduct of the neighbouring garrisons, while the impressions it occasioned continued to operate, he gave orders on the same day for the march of this detachment..." Losing no time, the British under Captain Welsh captured the fortress on 23 December 1791.